It’s that time of the year again! In May, Muslims around the world will observe the start of the holy month of Ramadan. One thing all Malaysians revel in, Muslim or not, is the scrumptious Ramadan buffet that is being offered in almost every part of the country. 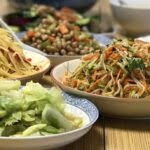 What’s better than an all-you-can-eat meal of local cuisines that remind you of the good ol’ days in the kampong? A value-for-money buffet, that’s what! 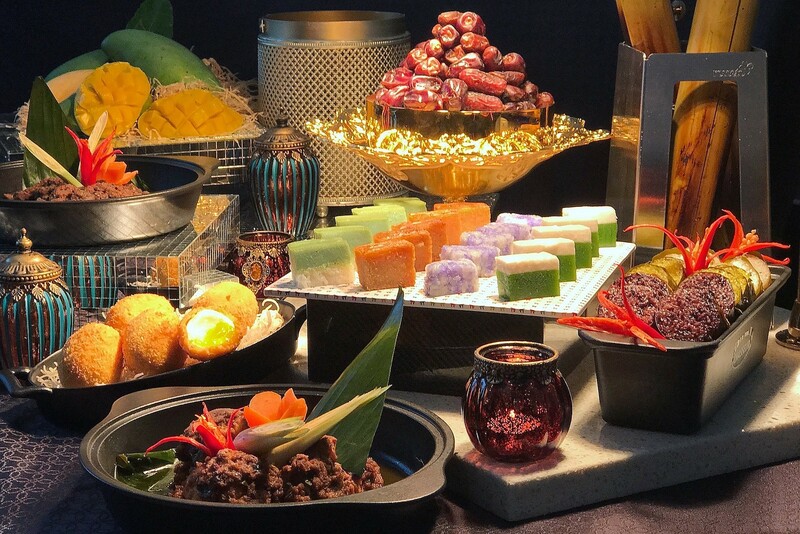 We’ve scoured the Klang Valley, and here’s the ultimate list of Ramadan buffet you can find – some of them priced below RM100 per person! Craving for some authentic and traditional Malay cuisines? Sample 101 recipes passed down by Tok Wans, all served at Vistana Hotel KL this holy month. There’s nothing more heart-warming then gathering with your family and friends to break fast over delicacies that remind you of home. * Children between age 4 and 12 years old. Available from 6th of May until 3rd of June. Early bird discount is available for bookings placed before 10th of May. In line with the theme “Sajian Tradisi Zaman Ke Zaman”, Seri Pacific Hotel brings you signature cuisine from all 14 states in Malaysia. Aside from the traditional Ramadhan items, they also offer a fusion of Indian, Chinese, Japanese, and Western options to go with you buffet. * Children between age 5 and 12 years old. Available now until 4th of June. Early bird price is available for bookings made before the 30th of April. 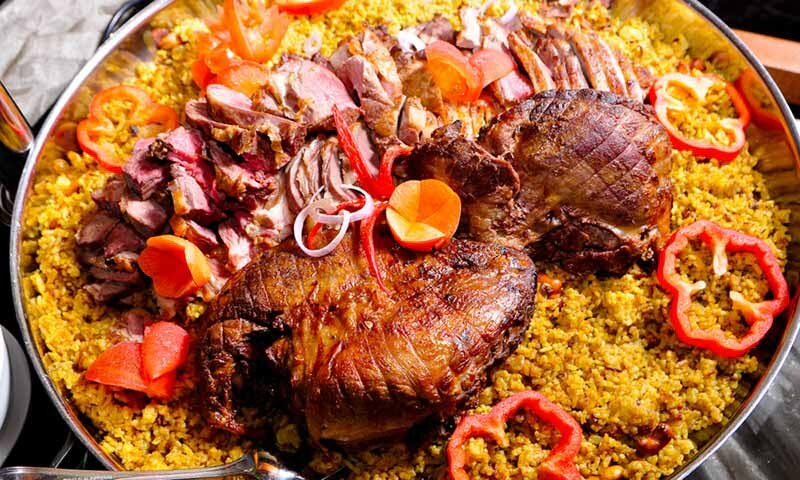 Indulge in a hearty, middle east cuisine this Ramadhan at the Shah Alam Convention Center. * Children between age 7 and 10 years old, and senior citizen is above 60 years old. Available from 11th of May until the 3rd of June. Early bird prices are available for bookings made by the 10th of May. Be prepared for a gastronomic storm at Bijan in its chic interior. With the ambience that brings back the nostalgia of the good ol’ days, your senses will be provoked by the various tastes of Malay gourmet cuisines. Available from 9th of May until the 31st of May. Early bird price is available for bookings made by the 8th of May 2019. This Ramadan, Corus Hotel is hosting the ‘Selera Ramadan’ buffet full of local flavours and spices at the Dandang Sayang coffee house. Available from 7th of May until the 3rd of June. Discounts available when you dine during the first five days and the last five days of Ramadhan. Not a fan of hotels? Shake things up and bring your family to one of the world’s famous golf course located in Mont Kiara. Let TPC’s ‘Lambaian Rasa’ cuisine give your tastebuds a taste of decadence. Available from 8th of May until the 2nd of June. Prices differ for members and non-members. 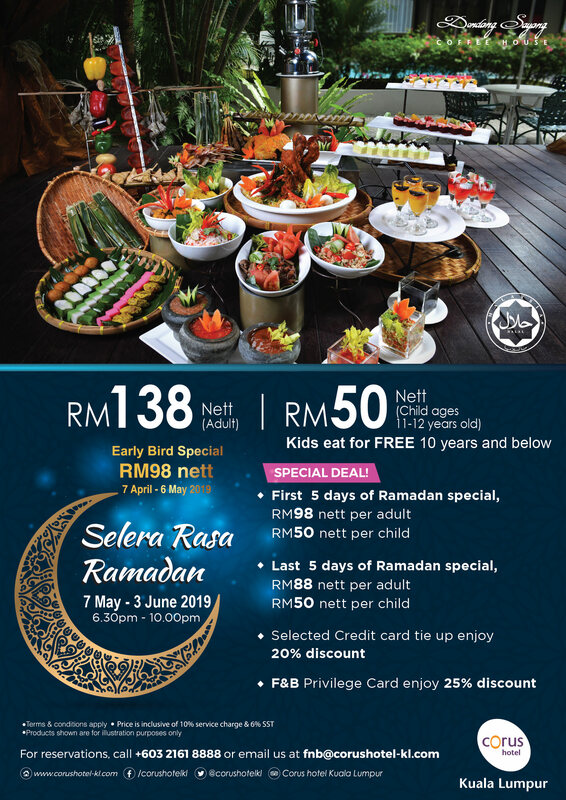 Break fast in style with exciting Ramadan Buffet this year at Sunway Putra Hotel. Let Executive Chef Rossham tantalise your tastebuds with extensive local and Asian delights – including six varieties of thematic stalls. Available from 6th May until 4th June. 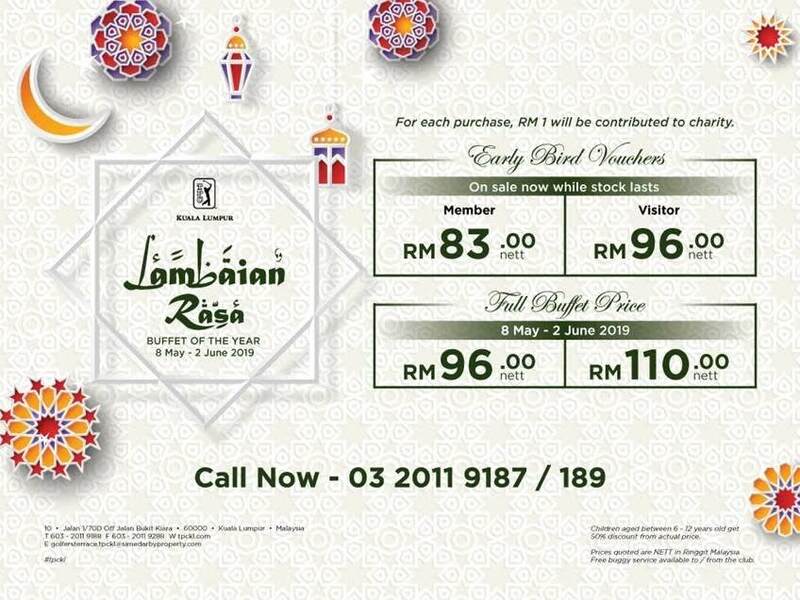 Purchase early bird voucher at a special price of RM90 by 30th of April. It’s time to tuck in with copious amount nasi ayam, nasi kandar, rojak mamak, satay and more. 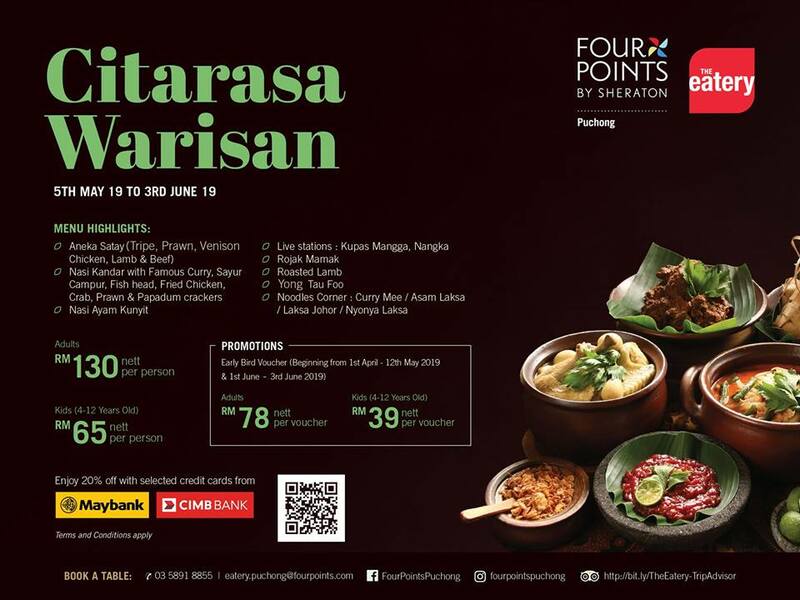 This Ramadhan, head over to Four Points by Sheraton in Puchong and experience their ‘Citarasa Warisan’ for a complete local indulgence. Available from 5th of May until the 3rd of June. Early bird vouchers available, call them to find out more. Psst.. you also get 20% off if you pay with selected cards from Maybank and CIMB. 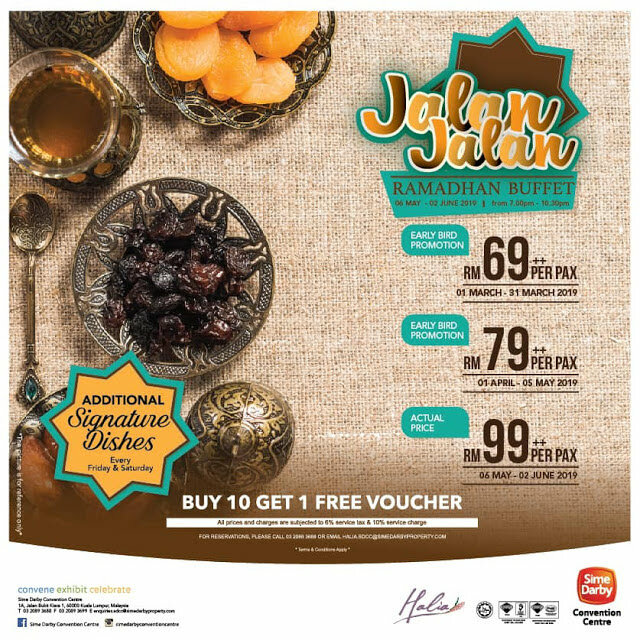 Pacific Regency Hotel Suites Kuala Lumpur is all set to give you delight you with their “Juadah Warisan” Ramadan spread. With over 150 selections, their emphasis is on traditional dishes – so you immerse yourself in plenty of rich, authentic flavours and spices. Available from 10th of May until the 31st of May. Early bird prices available between 10th April until 9th May. 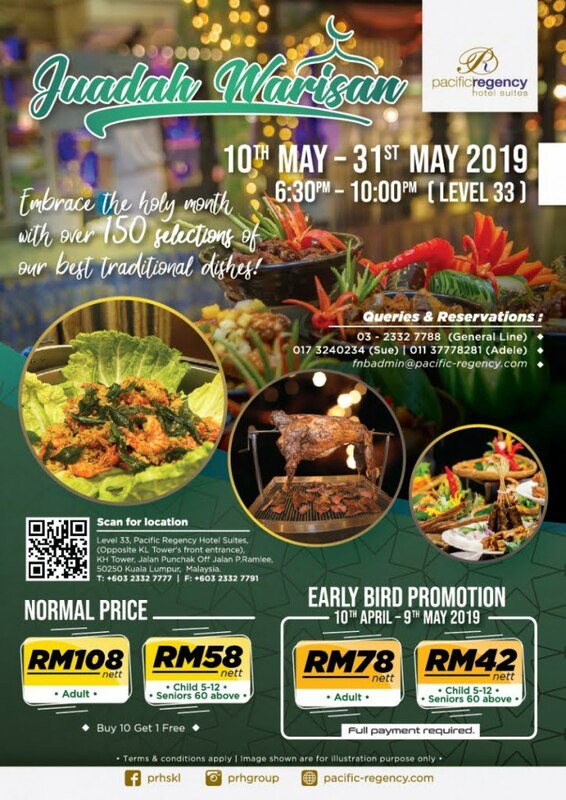 If you’re looking for something super-filling and super affordable for the family – head over to Sime Darby Convention Center this Ramadan. With delicious options including additional signature dishes every Friday and Saturday – it’s bound to be a real feast for you and your loved ones. Available from 6th of May until 9th of June 2019. Melting Pot by Concorde Hotel is determined to give you a wholesome buffet experience this Ramadhan. Themed ‘Citrarasa 6 Sekawan’, the buffet will feature over 160 dishes, with traditional dishes like ikan bakar percik and beef rendang – along with Indian, Chinese, Thai and Japanese cuisine. Available from 6th of May until the 4th of June. If you feel like splurging and pampering yourself, we recommend the decadent Barakat & Syukur buffet dinner spread in St. Regis. A celebration of Malaysia’s multi-ethnic cuisine, most of the recipes are derived from Chef Halim’s heirloom recipes. Treat yourself to his signature biryani and the slow-roasted grass-fed Australian spring lamb marinated in Malay spices. Aside from that, you’ll also find yourself flocking to the Roti John station, downing some piping hot Penang prawn noodles, and sweetening your palate with chunks of ambrosial mango. Available from the 1st until the 20th of June in the Astor Room. Where is your favourite Ramadan buffet? If you know a great buffet with affordable price, share it in the comments section below!